Functional processes in aquatic ecosystems – nutrient cycling, respiration, and primary production. Ecology of the hyporheic zone. 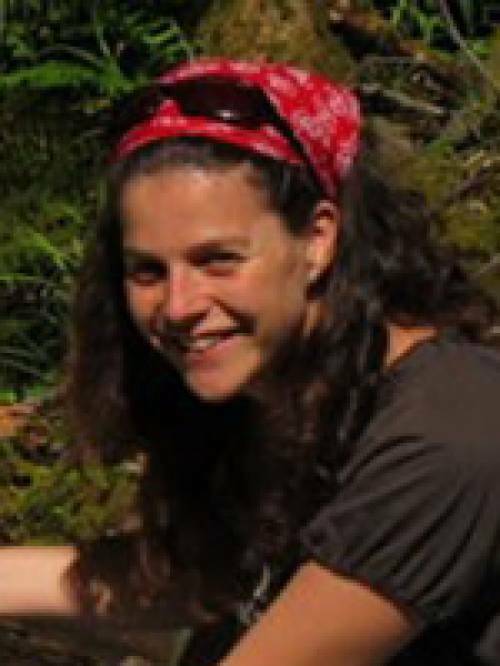 Argerich is an aquatic scientist interested in understanding the effects of land use on water quality and ecosystem integrity using experimental and modeling approaches. Her current projects include an analysis of the use of different bioengineering techniques to restore water quality in nutrient-loaded streams, the study of natural variability and trends of aquatic nutrients in reference streams, and an experimental analysis of the effects of contemporary forest practices on water quality and quantity. Song, C., W. Dodds, J. Rüegg, A. Argerich, C. Baker, W. Bowden, M. Douglas, K. Farrell, M. Flinn, E. Garcia, K. Gido, A. Helton, T. Harms, S. Jia, J. Jones, L. Koenig, J. Kominoski, W. McDowell, D. McMaster, S. Parker, A. Rosemond, , K. Sheehan, M. Trentman, W. Wollheim, and F. Ballantyne. 2018. Continental-scale decrease in net primary productivity in streams due to climate warming. Nature Geoscience 11: 415–420, doi: 10.1038/s41561-018-0125-5. Pennington, R., R. Haggerty, and A. Argerich. 2018. Measurement of gas-exchange rate in streams by the oxygen carbon method. Freshwater Science 37(2): 222-237, doi: 10.1086/698018. Kaylor, M. J., A. Argerich, S. White, B. VerWey, and I. Arismendi. 2018. A cautionary tale for in situ fluorometric measurement of stream chlorophyll a: influences of light and periphyton biomass, Freshwater Science 37(2), doi: 10.1086/697239. Arismendi, I., J. D. Groom, M. Reiter, S. L. Johnson, L. Dent, M. Meleason, A. Argerich, and A. E. Skaugset. 2017. Suspended sediment and turbidity after road construction/improvement and forest harvest in streams of the Trask Watershed Study, Oregon. Water Resources Research. doi:10.1002/2016WR020198. Ribot, M., S. Bernal, M. Nikolakopoulou, T. N. Vaessen, J. Cochero, E. Gacia, A. Sorolla, A. Argerich, F. Sabater, M. Isnard, and E. Martí. 2017. Helophytes enhance nitrogen and carbon cycling along subsurface water flowpaths receiving treated waste water. Science of Total Environment, 599-600, 1667-1676, doi:10.1016/j.scitotenv.2017.05.114. Krause, S., J. Lewandowski, N. Grimm, D. Hannah, G. Pinay, K. McDonald, E. Martí, A. Argerich, L. Pfister, J. Klaus, T. Battin, S. Larned, J. Schelker, J.H. Fleckenstein, C. Schmidt, M. Rivett, G. Watts, F. Sabater, A. Sorolla, and V. Turk. 2017. Ecohydrological Interfaces as hotspots for ecosystem functioning. Water Resources. doi:10.1002/2016WR019516. Argerich A., R. Haggerty, S.L. Johnson, S.M. Wondzell, N. Dosch, H. Corson-Rikert, L. Ashkenas, R. Pennington, and C. Thomas. 2016. Comprehensive multi-year carbon budget of a temperate headwater stream. Journal of Geophysical Research- Biogeosciences, 121, doi: 10.1002/2015JG003050. Haggerty, R., M. Ribot, G. A. Singer, E. Martí, A. Argerich, G. Agell, and T. J. Battin. 2014. Ecosystem respiration increases with biofilm growth and bedforms: Flume measurements with resazurin, Journal of Geophysical Research- Biogeosciences, 119, 220-2230, doi: 10.1002/2013JG002498. González-Pinzón, R., R. Haggerty, and A. Argerich. 2014. Quantifying spatial differences in metabolism in headwater streams. Freshwater Science 33(3): 798-811. doi: 10.1086/677555. Argerich, A., S.L. Johnson, S.D. Sebestyen, C.C. Rhoades, E.A. Greathouse, J. Knoepp, M.B. Adams, G.E. Likens, J.L. Campbell, W.H. McDowell, F.N. Scatena, and G.G. Ice. 2013. Trends in stream nitrogen concentrations for forested reference catchments across the USA. Environmental Research Letters 8(1): 014039 doi:10.1088/1748-9326/8/1/014039. Izaguirre, O., A. Argerich, E. Martí, and A. Elosegi. 2013. Nutrient uptake in a stream affected by hydropower plants: comparison between stream channels and diversion canals. Hydrobiologia, doi:10.1007/s10750-012-1354-z. Argerich, A., R. Haggerty, E. Martí, F. Sabater, and J. Zarnetske. 2011. Quantification of metabolically active transient storage (MATS) in two reaches with contrasting transient storage and ecosystem respiration. Journal of Geophysical Research: Biogeosciences, 116, G03034, doi: 10.1029/2010JG001379. Argerich, A., E. Martí, F. Sabater, and M. Ribot. 2011. Temporal variation of hydrological exchange and hyporheic biogeochemistry in a headwater stream during autumn. Journal of the North American Benthological Society 30(3): 635-652, doi: 10.1899/10-078.1. Argerich, A., E. Martí, F. Sabater, R. Haggerty, and M. Ribot. 2011. Influence of water transient storage on stream nutrient uptake based on substrata manipulation. Aquatic Sciences, doi: 10.1007/s00027-011-0184-9. Martí, E., D. von Schiller, A. Argerich, M. Ribot, F. Sabater, and J.L. Riera. 2011. El batec biogeoquímic de la Riera de Santa Fe del Montseny. Pages 287-298 in VII Monografies del Montseny. VII Trobada d’Estudiosos del Montseny Proceedings (November 20-21st, 2008, Granollers, Spain). J. Hernández, J. Grau, and J. Melero, editors. Col.lecció “Documents de Treball” de l’Àrea d’Espais Naturals de la Diputació de Barcelona, Barcelona (ISBN: 978-84-9803-409-7). Haggerty, R., E. Martí, A. Argerich, D. von Schiller, and N. Grimm. 2009. Resazurin as a “smart” tracer for quantifying metabolically active transient storage in stream ecosystems. Journal of Geophysical Research: Biogeosciences 114, G03014, doi: 10.1029/2008JG000942. Martí, E., P. Fonollà, D. von Schiller, F. Sabater, A. Argerich, M. Ribot, and J.L. Riera. 2009. Variation in stream C, N and P uptake along an altitudinal gradient: a space for time analogue to assess potential impacts of climate change. Hydrology Research 40(2-3): 123-137, doi: 10.2166/nh.2009.090. Haggerty, R., A. Argerich, and E. Martí. 2008. Development of a “smart” tracer for the assessment of microbiological activity and sediment-water interaction in natural waters: The resazurin-resorufin system. Water Resources Research 44, W00D01, doi: 10.1029/2007WR006670. Argerich, A., E. Martí, F. Sabater, M. Ribot, D. von Schiller, and J. Riera. 2008. Combined effects of leaf litter inputs and a flood on nutrient retention in a Mediterranean mountain stream during fall. Limnology and Oceanography 53: 631-641.
von Schiller, D., E. Martí, J. Riera, M. Ribot, A. Argerich, P. Fonollà, and F. Sabater. 2008. Inter-annual, annual and seasonal variation of P and N retention in a perennial and an intermittent stream. Ecosystems, 11(5): 670-687. Martí, E., F. Sabater, J.L. Riera, G.C. Merseburger, D. Von Schiller, A. Argerich, F. Caille, and P. Fonollà. 2006. Fluvial nutrient dynamics in a humanized landscape. Insights from a hierarchical perspective. Pages: 513-526 in The ecology of the Iberian inland waters: Homenage to Ramon Margalef, J. Armengol, R. Moreno-Amich and A. Palau, ed., Barcelona, Spain, ISBN-10: 84-921618-7-6. Martinoy, M., D. Boix, J. Sala, S. Gascón, J. Gifre, A. Argerich, R. de la Barrera, S. Brucet, A. Badosa, R. López-Flores, M. Méndez, J. M. Utgé, and X. Quintana. 2006. Crustacean and aquatic insect assemblages in the Mediterranean coastal ecosystems of Empordà wetlands (NE Iberian Peninsula). Limnetica 25: 53-70. Riera, J. L., F. Sabater, E. Martí, J. Comas, Ll. Godé, A. Argerich, M.A. Puig, G. Benito, and E. Llorens. 2006. STREAMES: un sistema de suport a la decisió ambiental per a la gestió fluvial. Pages: 309-320 in Ponències de les II Jornades Tècniques de Gestió d’Estacions Depuradores d’Aigües Residuals. A. Freixes i Perich, ed. Agència Catalana de l’Aigua, Publicacions de la Generalitat de Catalunya. (ISBN: 84-393-6628-0). Argerich, A., M. A. Puig, and E. Pupilli. 2004. Effect of floods of different magnitude on the macroinvertebrate communities of Matarranya stream (Ebro river basin, NE Spain). Limnetica 23: 283-294.